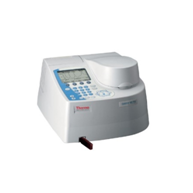 Thermo Scientific™ GENESYS 10S UV-Vis spectrophotometer utilizes a high-intensity xenon lamp and dual-beam optical geometry to deliver unsurpassed data quality. Firing pulses of light only when the instrument is taking a measurement, the xenon lamp provides strong illumination from the UV to the near-IR region of the spectrum. Whether your application is research or routine analysis, educational or industrial, you can count on the GENESYS 10S for accurate and reliable results.